As the rising cost of textbooks continues to burden students, some libraries have begun to facilitate the creation and sharing of Open Educational Resources. 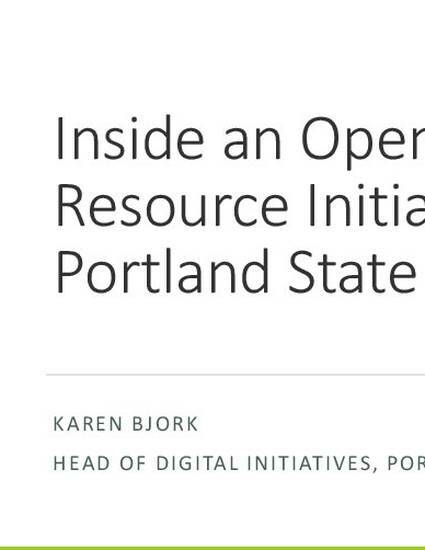 At Portland State University, Head of Digital Initiatives Karen Bjork has worked with faculty on campus to publish five new open textbooks in their repository, PDXScholar, all as part of a Provost-backed initiative. The initiative aligns with their institutional mission of better serving the student body: in their first term of use, the open textbooks saved students nearly $24,000! Over the course of the presentation, Karen will discuss the Provost’s initiative and how the library continues to work with faculty to create open resources. She’ll also go over some of the specific workflows they’ve used and provide best practices for those interested in working with their own faculty on OER.